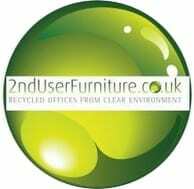 If you are a business or company looking to improve your working environment with like new office furniture, here at Second User Furniture we have an extensive range of used, second hand office furniture currently available in stock. Second User Furniture has a wealth of expertise when it comes to supplying used, second hand office furniture and our products are not only affordable, but they also come at a fraction of the price if you were to buy these products new! We are renowned for providing business and companies with high quality second hand office furniture, which includes second hand office chairs, second hand office desks, second hand designer chairs and second hand storage lockers, along with much, much more. We deliver nationwide and provide a professional service, where we can come and install your products in a timely and efficient manner that suits you. Sustainability is something we consider to be most important, hence why we offer a complete service. We can provide your company with an expansive range of products through recycling, buying and trading. We have a number of second hand office featured products available at the moment. New stock continues to become available each and every week. You can obtain a full description and get a more detailed view of each product by clicking on any of the links below. Elite Loreto Operator Chairs, (15 Products Available). Elite Opula Executive Chairs, (11 Products Available). Girsberger Operator Chairs, (12 Products Available). Komac Move Operator Chairs, (19 Products Available). Our featured products list will be updated every Monday morning at 9am with further new, second hand office furniture products that we currently have in stock. If you no longer need your used, second hand office furniture products and are looking for a company that has many years of experience in the business of specialized clearance solutions, our sister site Clear-Environment which is a registered broker of the Environment Agency, provide office clearance & business recycling services nationwide. Clear-Environment removes used, second hand office furniture, IT & electrical items, appliances and general waste, with a strict ‘no land fill’ policy. Simply click on the link provided in the paragraph above to view their website and available services. We currently have an extensive range of products in stock at the moment and you can use our Navigation Links at the top of the page to quickly find the products that your company might be looking to purchase. For further information about a product or products listed on our website, you can get in touch with one of our friendly sales team who are available between the hours of 9am – 5pm, Monday to Friday directly by calling 07944 508282. If you are viewing our website using a Mobile Device, we also have a Telephone Icon located at the bottom of each page, just click on the icon using your Mobile Device and you will be put straight through to our sales team. You can also Email our sales team by clicking on the Contact Us link located at the top of the page. Latest products – Click here to see the latest used office furniture that is currently available in our warehouse showrooms. Become an Introducer : As our stocks of second hand office furniture are continually being redistributed throughout the year,…..
Testimonials – Read what our happy clients say about us. We offer great second hand office furniture and equipment at realistic prices, with money back and satisfaction guarantees. Also, why not consider our used office furniture sale and guaranteed buy-back scheme, instead of hiring? We always use skilled removals men and fitters, although you are welcome to collect your used office furniture if you prefer. If you need any help with your move, due to our extensive experience in removals and clearance, we can offer that too! We have second hand office furniture warehouses in London, Exeter, Northampton, Birmingham, Liverpool and Manchester, as well very strong and dependable trade partnerships throughout the UK. Our experienced team can help you comprehensively plan, design and implement your office environment. We guarantee the removal of all items, whilst providing a complete service ensuring that all your unwanted used office furniture and equipment is properly disposed of.